Honey badgers are essentially solitary with no male involvement in parental care in a non-territorial polygynous or promiscuous mating system. In depth information is only available from the southern Kalahari . 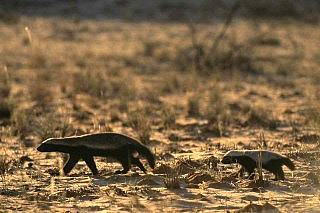 In southern Africa, honey badgers do not have a breeding season and cubs are born throughout the year. Contrary to information in some field guides, badgers do not regularly have more than two cubs at a time and in the Kalahari badgers raised only one cub after a gestation of six to eight weeks. The cubs are born naked and blind in a hole prepared by the female and she will typically move the cub to a new den every two to five days, by carrying the cub in her mouth. The cub develops slowly with its eyes only opening after two months, and will emerge from the den and accompany its mother on short foraging bouts at three months of age, by which time it has the adult's black and white colouration. The cub's mantle is usually far whiter than its mother. Research in the southern Kalahari showed that cubs stayed with their mothers for a minimum of 14 months, before becoming independent. This is in marked contrast to the Eurasian badger which may become independent at 3 months. This long period of dependency is needed for the cub to learn how to hunt efficiently as digging and climbing require a degree of co-ordination and technique that is lacking in the juveniles for the first eight months. Techniques for catching rodents in their extensive tunnel systems and escape holes and killing poisonous snakes require skills that must be learnt from their mothers. Juveniles may reach almost adult size within eight months and a son may be far larger that his mother. When one sees two badgers foraging together in the wild, these are usually a mother and her cub, rather than a "pair", even when one badger is substantially larger than the other.